Are you having a Great Weekend? Last year when I saw mice running up and down Susan's stairs at Between Naps on the Porch I thought I was going to LOL. What a hoot. I knew I wanted some mice. This year while spending to much money in Michael's craft store I found the package of mice. I recruited my 9 year old granddaughter into helping me place the mice is strategic locations though the house. . . I love the black hole in the wall. Oh my gosh! We have a mouse running into the house while the back door was left open. My granddaughter and I loved this one. My Sweetheart will look right at this mouse every time he sits down in the recliner... Remember the recliner next to the candy table? Oh this is a good one too. A mouse climbing up the wall. The coffee maker is sitting on the counter above. LOL. We sure did get a big laugh putting the mice around the house. I think this is the best. In the bathroom. Guess who's bathroom? Thanks so much for indulging me in a fantasy. I had a great time and I know my granddaughter did too. OH!!! I hope my grandson never wants to put mice around his or our house. I do not like them even if they are toy / pretend ones. I don't like mouses, but this one is special. Ha ha ha. I love that Betty!! 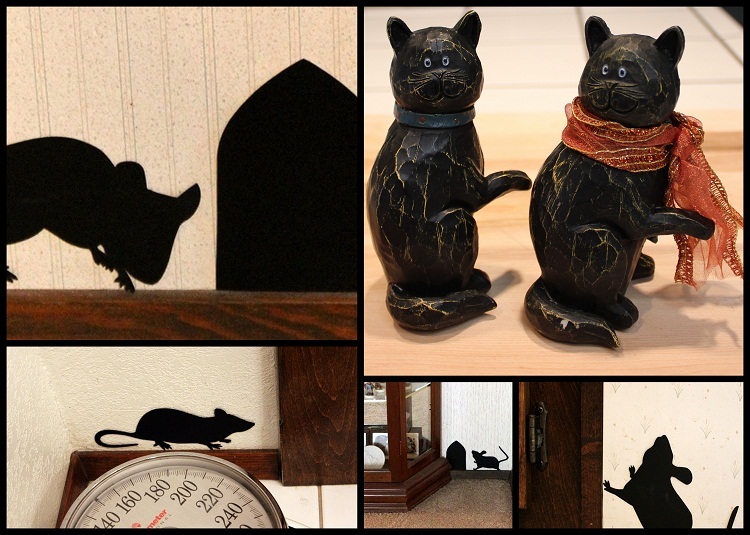 I've seen those on Martha Stewart and always thought them such fun -- of course, living in the country, mice a real and I do EVERYTHING in my power to keep them out, lol. Those are so darn cute!! Love them!! Oh my gosh! this is a lovely post! My son loves "mouseys" that's how he calls them, this is a great idea for his room. thank you!